Take this as a sigh of relief for the high fliers. Atlast the Kingfisher flight IT 4131 landed in Belgaum, but there was delay as per Flight Stats.com which mentions a delay of 33 mins in arrival at Belgaum and about 44 mins delayed arrival at Mumbai. This was after many days that a commercial flight had landed on Sambra airport, the last being the KF’s Belgaum- Bangalore flight which had flown from here on 16th June 2009. Sources from KF say that the Belgaum- Bangalore flight might also commence around March end as they still have to get the landing spots in Bangalore. good move, now other ways also shoulde be opened…………..
At ………last they did it. Congratulations… to everyone who has taken active participation. HOPEFULLY They will develope other ways aswell. This ATR Aircraft which has seating capacity of 72 as KF mentioned. its nice to hear that KF agained resume the flight service but i think timing is not suitable for belgaum people.at the same time they should consider about belgaum bangalore air srevice. Hey Folks its an ATR Aircraft which has a seating capacity of 40 as one more reader rightly mentioned. Aftter all Something is better than nothing you see. 1. A full fledged FM Radio Station. Bangalore. If there is a plant cultivation centre in Belgaum, There will simply be a great market. 4. Make the design of the Bus stops identical inall places. Hi Mr. Naik, could you tell me which radio station is gonna be launched out there? following information is not available. fisher is ATR,which one is correct. I will be glad if the above information is furnished. 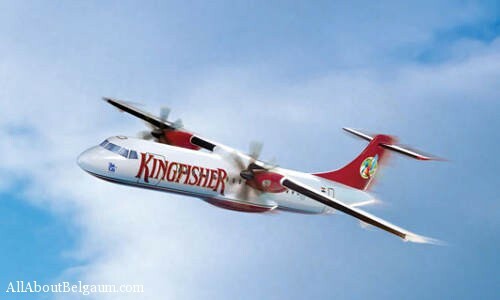 The King fisher schedule mentions that the flight from Belgaum to Mumbai is ATR ( fan propelled),but the one shown on your blog is A320 type aircraft. Kindly let me know what type of Aircraft it is. @ S M Naik, Its KF Red not KF A320, it will accommodate up to 40 seats. What was the density of passengers on the start Uday? I only hope they keep this service alive!! How was the response on day 01? Any updates?